The Ace Combat franchise has always delivered the quintessential aerial combat experience. From the sounds of its iconic radio chatter, its epic storyline, to giant aerial boss fights, Ace Combat has made countless gamers’ fighter pilot fantasies come true and Ace Combat 7: Skies Unknown will take those fantasies to new heights with the best graphics, highest-tension drama, and most visceral action ever presented in an ACE Combat game. Ace Combat 7: Skies Unknown is preparing for take-off in the Americas on January 18, 2019 for the PlayStation 4 and Xbox One. 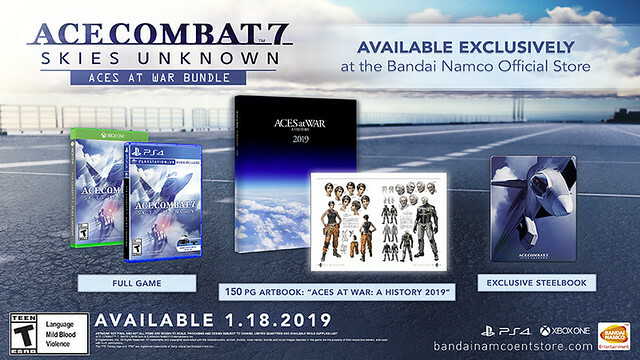 Ace Combat 7: Skies Unknown for PCs via Steam will launch on February 1, 2019. Yes, there is a cockpit view available. Most of the videos shown so far show many of the available camera modes, such as switching between behind the plane, camera following the target, and cockpit views.